"For the past century, the conspicuous alternative to the positive-caloric-balance hypothesis has always been, as Pennington, Astwood, and Hilde Bruch suggested, that obesity is caused by a defect in the regulation of fat metabolism. At the risk of repetition, it is important to say this is, by definition, a disorder of fat accumulation, not a disorder of overeating. For whatever reason , the release of fat or its combustion is impeded, or the deposition or synthesis of fat is promoted, as Astwood said, and the result is obesity. That in turn will cause a deficit of calories elsewhere in the body— Astwood’s “internal starvation”— and thus a compensatory hunger and sedentary behavior. "In this hypothesis , obesity is another variation on the theme of insulin dysfunction and diabetes. In Type 1 diabetes, the cause is a lack of insulin. The result is an inability to use glucose for fuel and to retain fat in the fat tissue, leading to internal starvation, as Astwood put it, excessive hunger, and weight loss. In obesity, the cause is an excess of insulin or an inordinate sensitivity to insulin by the fat cells; the result is an overstock of fuel in the adipose tissue and so, once again, internal starvation. But now the symptoms are weight gain and hunger. In obesity, the weight gain occurs with or without satisfying the hunger; in Type 1 diabetes, the weight loss occurs irrespective of the food consumed. "This half century of research unequivocally supported the alternative hypothesis of obesity. It established that the relevant energy balance isn’t between the calories we consume and the calories we expend, but between the calories— in the form of free fatty acids, glucose, and glycerol— passing in and out of the fat cells. If more and more fatty acids are fixed in the fat tissue than are released from it, obesity will result. And while this is happening, as Edgar Gordon observed, the energy available to the cells is reduced by the “relative unavailability of fatty acids for fuel.” The consequence will be what Stephen Ranson called semi-cellular starvation and Edwin Astwood, twenty years later, called internal starvation. And as this research had now made clear, the critical molecules determining the balance of storage and mobilization of fatty acids, of lipogenesis and lipolysis, are glucose and insulin— i.e., carbohydrates and the insulin response to those carbohydrates. Here are glucose (mg/dL, top), NEFA (mEq/L or mmol, middle), and Energy Available (kcal/L, bottom). I stretched the EA plot a bit vertically for detail, and horizontally to match up the time scale. What jumped out at me the first time I read this paper was the axis units on EA = kcal/L. With the exception of about 30 minutes -- between 15 and 45 minutes after the ~650 cal meal, the EA remains roughly between 4 kcal/L and 5 kcal/L, or the total energy in 5 liters of blood is between perhaps 20 and 25 kcal. A kcal is a single Calorie. Five -- 5! -- Calorie total swing. So again, not all time points were included here, but Total EA remains between 4-5 kcal/L except for the 30 minute spike. While the ratios of circulating substrates were different for the low carb, we see that the least glucose contributes is still over 70% of the Total EA. Immediately after the High GI LF meal, glucose makes up over 90% of the Total EA. Normal fasting glucose of 80 mg/dL and fatty acids of 0.4 mmolar, gives a 77% glucose, 23% FFA split of circulating EA of just under 4.2 kcal/L. To get a 50-50 split of EA between glucose and FFA, one has to go with quite a low glucose of 60 mg/dL and a fairly abnormally high FFA of 1.0 mmolar. In other words, the nature of the calories the cells have access to always favors glucose. The Respiratory Quotient, RQ, is the ratio of O2 consumed to CO2 produced, and reflects the relative amounts of carbohydrate or fat that are oxidized for energy. 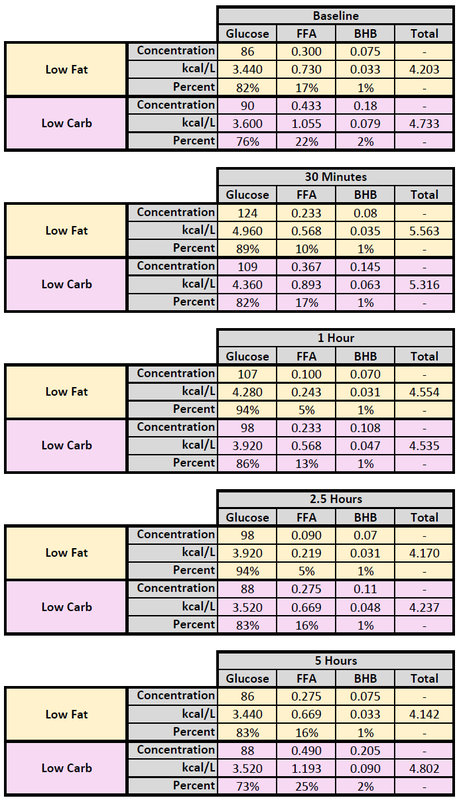 An RQ of 0.7 is complete fat burning, and RQ of 1.0 is complete carb burning. Usually RQ values are in the 0.8s, but this is highly variable. I have just shown that even under extreme conditions, the caloric proportions of circulating substrates -- e.g. EA -- would make an RQ of 0.7 impossible. A 1:1 ratio (RQ = 0.85) would be nearly unattainable, and most of the time the ratio of glucose to fatty acids will exceed 2.5:1. Thus, which substrates are consumed by the cells for energy is not a direct function of circulating supply. Based on the hundreds of glucose and NEFA levels and profiles that I've seen in various studies, coupled with the background physiology, it is fair to say that glucose levels are much more tightly regulated. There is also a pretty definitive minimum (that can be pushed lower in ketosis) for glucose, whereas there does not appear to be a lower danger limit for NEFA. If such exists, it is apparently near impossible to achieve either with diet or drugs. I have seen NEFA suppressed below 0.07 mmolar (using an exogenous agent) with no indication of safety concerns in the experimental protocol. Can you imagine a study allowing people to be given something to drop their blood glucose to 30 mg/dL? This level of NEFA is more like dropping glucose to 10! The tracking of hunger with EA is most similar to the profile for NEFA such that: low NEFA = low hunger, high NEFA = high hunger. This is in direct opposition with the notion of "starving cells". As I've discussed, non-adipose, aka ectopic, cells receive higher than normal NEFA delivery (often resulting in fat accumulation) when the circulating EA from fatty acids is high as in obesity and diabetes. But this puts the kibosh on the whole insulin → low NEFA → hunger → eating more. Hyperphasia (overeating) has been shown experimentally when glucose levels dip too low, however. When I read GCBC I had a derisive laff at his false analogy between growing teenagers eating a lot (they're growing on the inside! Their cells are starving!) and the obese eating a lot (they're growing on the inside! Their cells are starving!). Or something along those lines. Taube$ is the King of logical fallacies, faulty reasoning, and cognitive biases. And, I suspect, outright deliberate fraud. You'll also see D- β-hydroxybutyrate abbreviated as “β-OHB”. Hitting the headlines in the UK press this week - a research team from a Scottish university headed by none other than Zoe Harcombe. The article in the Guardian titled " Research criticising 1980s fat guidelines misguided, say scientists" was but one of many throughout the press and national TV and radio. It's interesting that Harcombe is now regarded as a leader in nutrition science. Open Heart journal is a joke. They are using the credibility of the BMJ to publish things up, most of which are editorial/review articles. It probably helps that her coauthor is an Associate Editor. It's all over the media because BMJ promotes the hell out of some of these studies. Thus attracting more $3000 a pop submissions. Low carbers are always good for a laugh, the comments sections of the UK newspapers have been plagued by them this week, "Every doctor should be made to read Kendrick", " This proves Gary Taubes was right all along" ,"Watch the Lustig video and see how you've been taken for ride by government advice" etc. Saturated fat is not so bad for you suddenly becomes "don't eat carbs" . Zoe Harcombe in her myths and facts section of her website states as a fact that 1.5 billion people in the world are obese, that raises the question as to what the several billion who are not obese are eating, presumably they are all on the Atkins diet with not a carb in sight, can't be that they are eating less because calories don't count. Carbs in the form of rice and flour, beans and legumes, root vegetables are the cheapest food the world over. One finds it refreshing to return to this blog and others of a similar ilk where no food is demonized. Yes, similar situation over here... It's no surprise, of course, given the message of those articles. This kind of misrepresentation of science seems to get more and more common. It was similar in the case of the "rehabilitation of saturated fatty acids" and it is even worse every time the topic is any kind of cardiovascular drug. One scientifically ignorant person "vindicating" the distortions and mistruths of another scientifically ignorant person. Does anyone know what Groves died of? "When Oxfordshire Cotswolds native Dr. Barry Groves and his wife Monica decided to start on a low-carb, high-fat diet beginning in 1962, all of his friends and family thought he was crazy. But when this nutritional scientist Ph.D. lost weight and greatly improved his health by eating supposedly-forbidden foods like butter, full fat meats and cheeses and lard while eschewing blood sugar-spiking carbage foods like bread, pasta and rice, Dr. Groves was the one who had the last laugh. It allowed him to live a long and healthy robust life with over a half century of enjoyable low-carb, high-fat living as one of the UK’s strongest advocates for this healthy lifestyle change. Dr. Groves passed away last night, April 29, 2013 at the age of 77." A "long(!) and healthy robust life" that ends at the age of 77(!) in the 21st century??? Evelyn, did Barry Groves have a PhD in nutrition? I'd never heard of him and I've been trying to find out. All it says on his site is 'Second Opinions is the website of Barry Groves PhD', with nothing about where his PhD came from or what the subject was. He seems to have been an electronics engineer. Not all low-carb advocates croak early: Wolfgang Lutz made it to 97. Lutz did not advocate an extremely low carb Jimmy Moore-type diet. In Leben Ohne Brot(1967)—[i.e., "Life Without Bread"], Lutz advised ~72g/day of carbs, which is right in the middle of that 50 to 100g range cited above that prevents all those listed unwelcome side effects produced by greater carb restriction. As to whether such a moderate and non-extreme 72g/day low-carb diet merits being called "sick"? Well, this is, shall we say, an unscientific appraisal, and in this department opinion divides. "With a doctorate in nutritional science from the American distance learning university, Trinity College & University, (NOT the Spanish diploma mill with a similar name) gained from 20 years’ research experience and a 60.000-word dissertation on the Politics of the Fluoridation of Public Water Supplies (Commercial version), he now divides his time between writing and giving talks to Womens’ Institutes, Probus, and other groups and as a guest lecturer on cruise liners. " I don't mean to imply that LC is necessarily killing these folks, just that with Groves, his diet may well not have been the healthiest choice for him. I don['t know what his cholesterol levels were, but he was a THINCS founder. Somone mentioned Kendrick. That's him (blue shirt) and 3 other THINCers at a recent event. I'd take these folks more seriously if they weren't all so inflamed looking as they lecture everyone else about how carbs cause inflammation and how healthy they are on their LCHF diets. Thanks. Dunno how I missed it. Barry Groves was an engineer. His 'PhD' in nutrition was obtained from a diploma mill. It seems Zoe's failure to disclose her very relevant competing interests (shareholder in a LCHF diet company plus two publishing companies for her books) has not gone down too well with the editors of Open Heart. If they follow BMJ policy not only will these now be added, but also a note that the authors failed to disclose them. For someone obsessed with the perceived conflicts of others she appears to have been hoist by her own petard! What LCHF diet company? Her own franchise or something else? I am hoping Open Heart has a Heart to Heart with itself REALLY soon. The whole BMJ for that matter. Just who and in what capacity are Harcombe and DiNicolantonio affiliated with on any given day? The Harcombe Diet Company Ltd seems to be the vehicle which runs the diet club, paid membership forums, '30 days blitz product' etc. Columbus Publishing Ltd and Columbus Digital Services Ltd are the publishing company of the hard books and kindle downloads (obesity epidemic, harcombe diet, why do we overeat). Not multi million pound businesses, but without business which would benefit massively from - and have argued for - vindication of sat fat. Equally, who peer reviewed it? Because they are also supposed to flag up concerns about undeclared competing interests too. DiNicolantonio did not appear to have much of a role in the study so he was likely the "Editor" on this one. However it states external peer review, so at this point I'm beginning to wonder exactly what that means over at Open Heart. DiNicolantonio's "Affiliations" have changed a few times in articles in that journal. His affiliation with Wegmans (for those not familiar, that's a food chain not quite as fancy as Whole Foods but a step up from your basic) is mentioned in a Jan 29 article, but not in the Feb 9 one with Harcombe. However before that he's just at Saint Lukes, but one time it gives the department he's in. It's minor, but you'd think that an Associate Editor would be consistent? SIgh. Unfortunately I can't find a public link to their COI disclosure form. One would think these things would be pretty specific to list what should be disclosed. Open Heart is a BMJ Group publication. This brings DiNicolantonio into question as well as Harcombe, as Zoe is "friends" with DiN having authored papers with him before. He is an editor and co-author on her paper. His position as Associate Editor needs to be disclosed IMO. But I don't see any statement with the article. Don't really know what that means.